"A wonderfully easy recipe that even my young sister-in-law can make. She isn't the best cook in the world because she is new at it. But her family was impressed when she made this simple pie." Mix cream cheese, white sugar, and vanilla extract in a large bowl until smooth. Stir 3/4 cup mashed strawberries into cream cheese mixture. Beat heavy cream and confectioners' sugar in a glass or metal bowl until stiff peaks form. Lift your beater or whisk straight up: the cream will form sharp peaks. 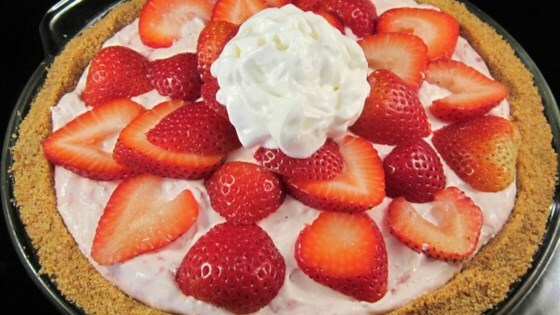 Fold whipped cream into cream cheese mixture until evenly mixed; fold in remaining 1/4 cup sliced strawberries. Spoon strawberry mixture into graham cracker crust. Chill at least 3 hours before serving. This easy pie is dense with dark-chocolate flavor. Garnish with additional strawberries and fresh mint. Made as printed. This tasted very good but did not firm up. YUM!!!!! Guilt free healthy dessert! I subbed the 1/4 cup sugar for maple syrup and eliminated the sugar in the whipped cream and it was heavenly! My whole family loved it! Mine came out a little runny...but my guests raved about the flavor. Very delicious! Yummy. I drained the juice from the mashed strawberries before adding to mixture because someone commented that it was a little runny. Turned out perfect! My coworkers and I gobbled this right up. Very good! I drained mashed strawberries as someone suggested as to help filling set better. Turned out fantastic. Great fresh strawberry taste. Used shortbread crust. Fun recipe to build fun in the kitchen with my daughter. She is seeming to be a natural!